Original Format is exactly "Letter"
Letter to Cardinal Dougherty from Juan Francisco de Cardenas, includes translated letter of Archbishop of Toledo about the persecution of Catholics in Spain. 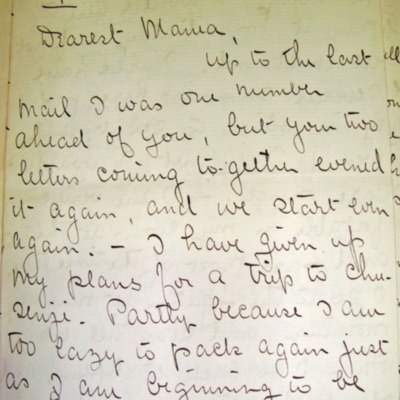 Correspondence between Cardinal Dougherty and Christina Casey, 1934. 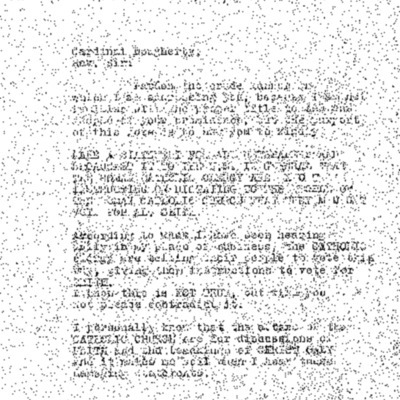 Correspondence between Cardinal Dougherty and Christina Casey regarding the movie boycott. Letters to Cardinal Dougherty from the Congregation of St. Michael of the Saints, on the removal of the Trinitarian Fathers from St. Michael of the Saints Parish. 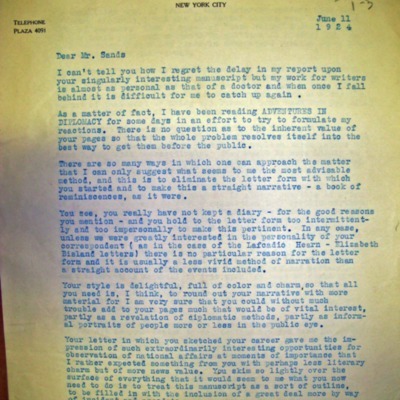 Letter to Cardinal Dougherty, from Reverend Paschal Boland, 08/05/1946. 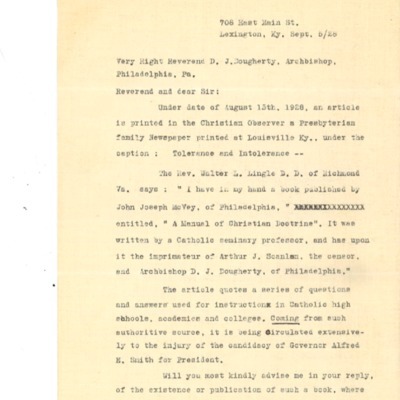 Letter to Cardinal Dougherty, from Reverend Paschal Boland, contains information on apparitions of the B.V.M. 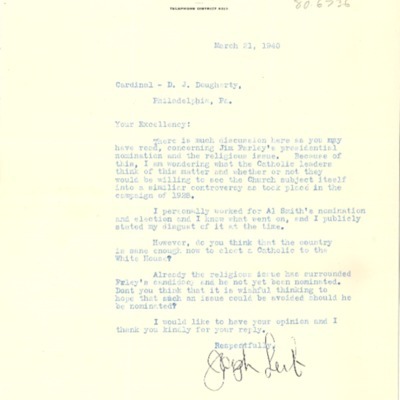 Letter to Cardinal Dougherty, from Gilbert L. Hall, 03/05/1951. Letter to Cardinal Dougherty, from Gilbert L. Hall, on present conditions in the Philippines. 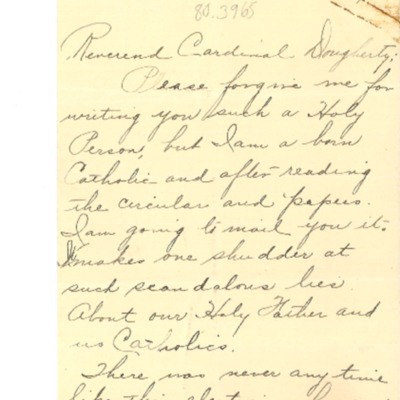 Letter to Cardinal Dougherty from Bishop Peter Bucys, 12/31/1932. Letter from J. Hunter Wells MD to William Franklin Sands, May 9, 1916. Letter from J. Hunter Wells MD to William Franklin Sands. from the Caroline A. Ladd Hospital, Pyengyang, Korea, tells of surgical practice, use of local anesthesia for major surgery, etc and gives news of family. Letter to Reverend Francis P. McDonald from Cardinal Dougherty about the suppression of St. Brendan’s Parish. Correspondence between Cardinal Dougherty and Reverend Francis P. McDonald about the running of St. Brendan parish. Letter to Cardinal Dougherty from Reverend Francis P. McDonald, acknowledging his appointment to St. Brendan parish. Memo to Cardinal Dougherty on the suppression of St. Brendan’s Parish, Philadelphia. 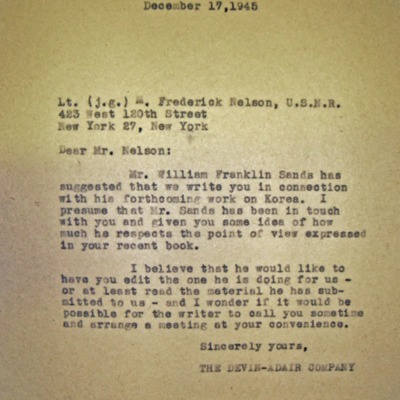 Letter from William Franklin Sands from Sumner Welles. 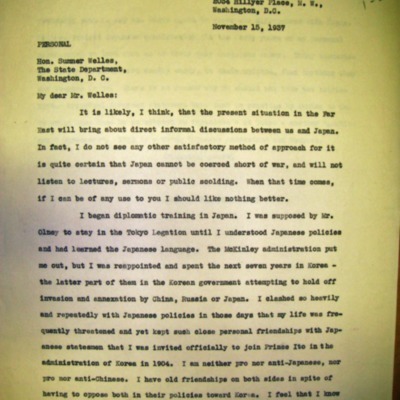 Carbon copy of Sands' letter offering diplomatic services re: Japan; reply: will contact if needed. 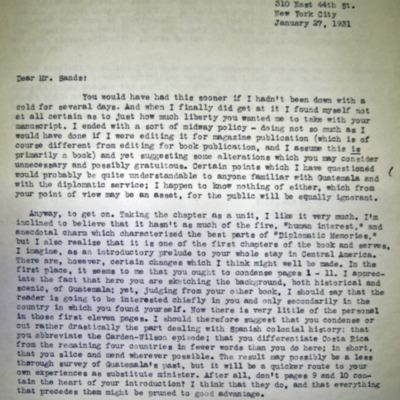 Letter from Mathilde Weil to William Franklin Sands, recommends and details changes in ms. of Adventures in Diplomacy. 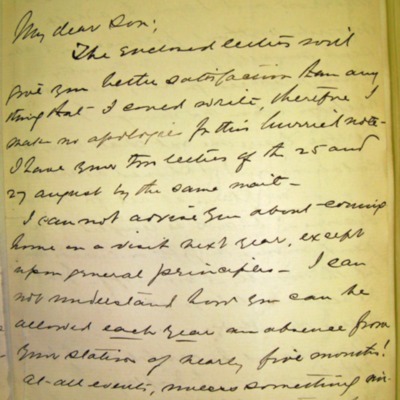 Letter from Richard Sherman to William Franklin Sands. 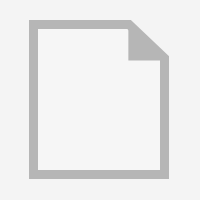 Suggests improvements for ms. of first chapter of projected book by Sands. 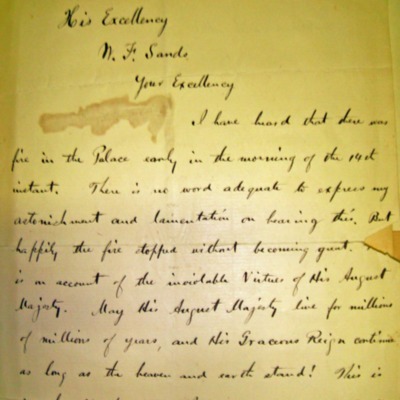 Letter from unknown to William Franklin Sands in regards to a fire at the palace. 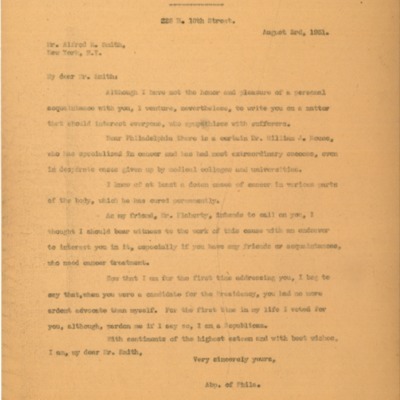 Letter from Teh Moo to William Franklin Sands, about his arrival in Washington D.C.
Letter to Cardinal Dougherty, from Joseph Leib, 03/21/1940. 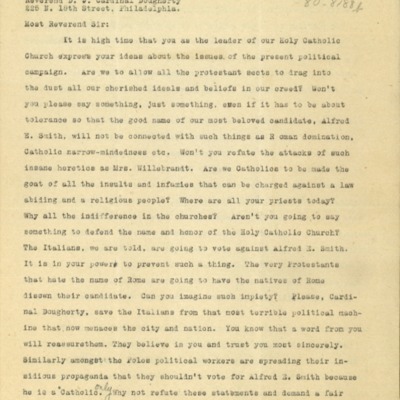 Letter to Cardinal Dougherty, from Joseph Leib, concerning the nomination of Farley/Al Smith for the Presidential Election. 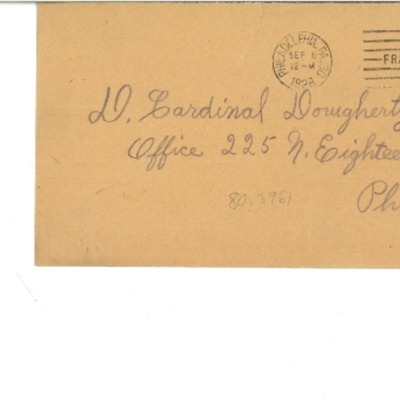 Letter to Honorable Alfred E. Smith, from Cardinal Dougherty. Discusses cancer and Smith's presidential run. 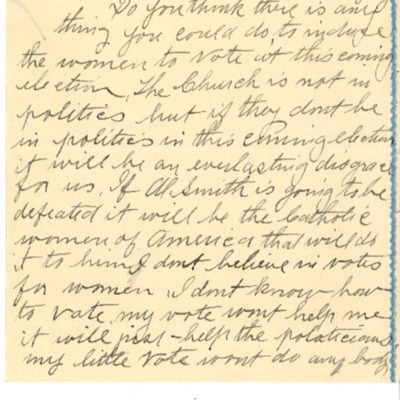 Letter to Dennis Cardinal Dougherty, from anonymous, urges the Cardinal to urge women to vote for Al Smith for President. Letter to Dennis Cardinal Dougherty, from “A True Born Catholic,” Discusses “Persecution” of Catholics for Smith, and anti-Catholic Propaganda includes sample. 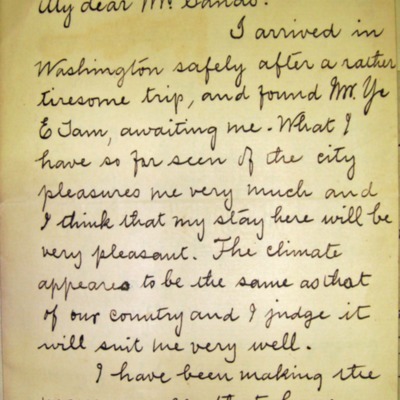 Letter from Edwin Dun to William Franklin Sands, discusses Dun's travel in American and plan to return to Japan. 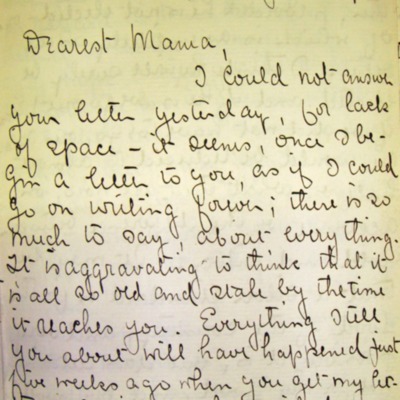 Letter from William Franklin Sands to his mother, Mary Elizabeth Sands. Discusses life in Japan, including attending the Emperor’s ball. 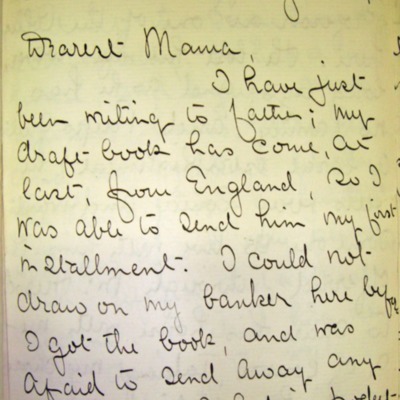 Letter from William Franklin Sands to his mother, Mary Elizabeth Sands. Discusses life in Japan. 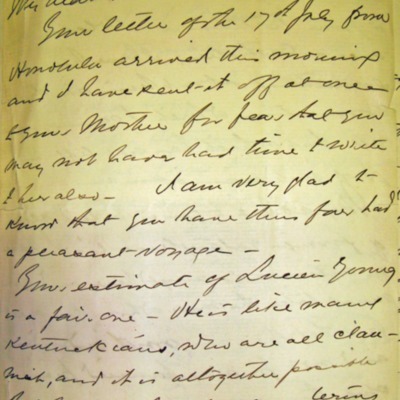 Letter from William Franklin Sands to his mother, Mary Elizabeth Sands. Discusses meeting Edwin Dun, envoy to Japan, as well as Japan culture and women. 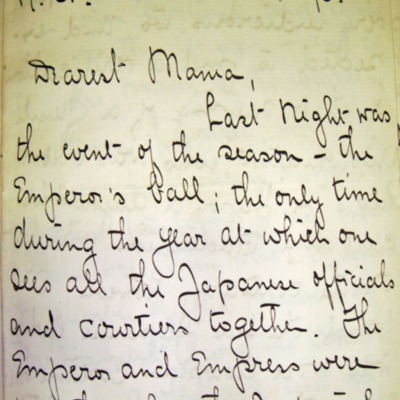 Letter from Adm. James Hoban Sands to William Franklin Sands, gives advice to William for the Diplomatic Corps. 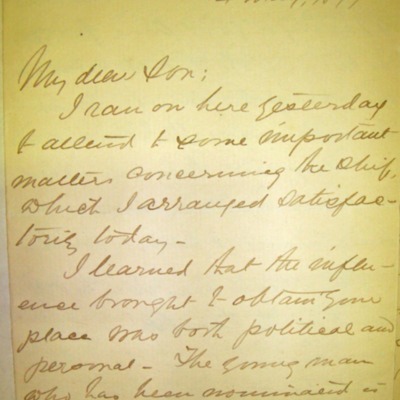 Letter from Adm. James Hoban Sands to William Franklin Sands, discusses family events and sending William a silk hat. Typed Preface to something. It talks about the formation of the diplomatic corps. Letter from Devin A. Garrity to Lt. M. Frederick Nelson (USNR), 11/17/1945. 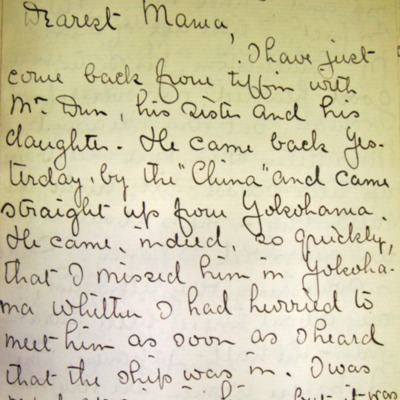 Letter from Devin A. Garrity to Lt. M. Frederick Nelson (USNR). 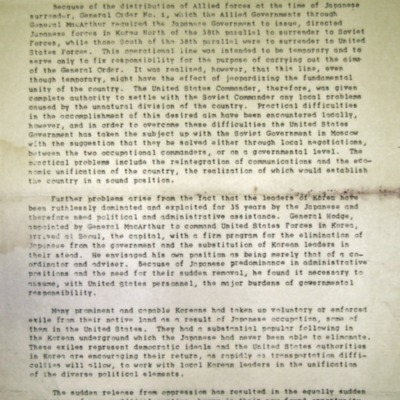 Letter on behalf of William Franklin Sands and his book on Korea. 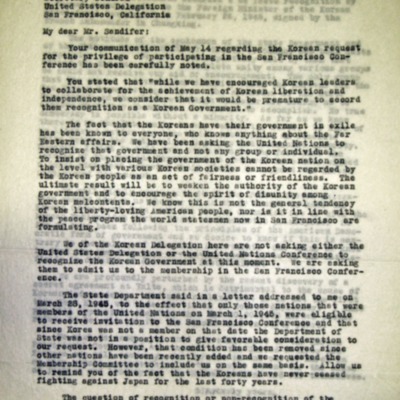 Letter from Sygman Rhee to Durward V. Sandifer (Secretary General, US Delegation), 5/15/1945. 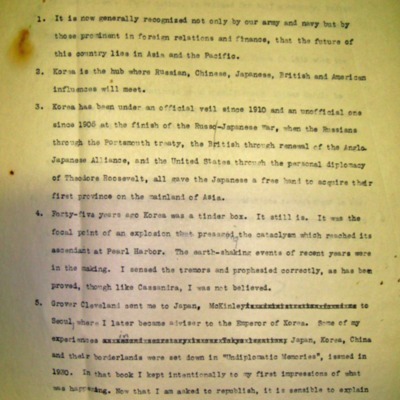 Letter from Syngman Rhee to Chairman of UN Conference, 5/5/1945. 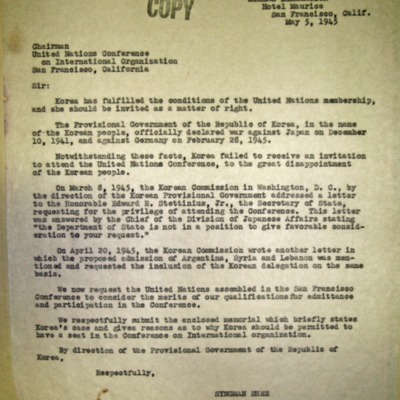 Letter from Syngman Rhee to Chairman of UN Conference. Discusses Korea's admittance to the UN, since they have met the qualifications. 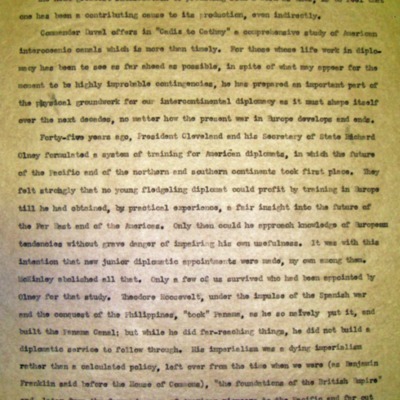 Press Release from the Department of State, 11/16/1945. 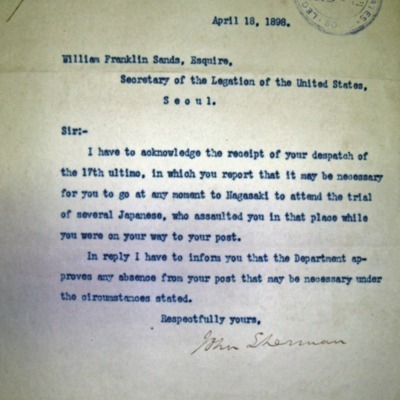 Letter from John Sherman to William Franklin Sands, 04/18/1898. 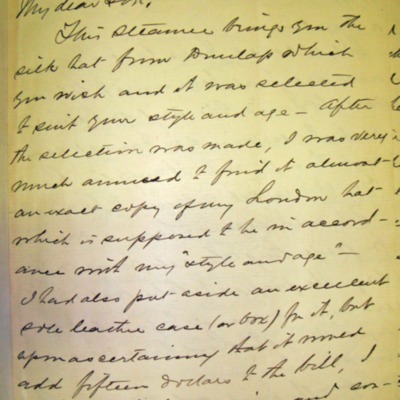 Letter from John Sherman to William Franklin Sands. Sherman acknowledges that Sands may have to go to Nagasaki to testify against the Japanese people who assaulted him. Letter from Ye Chayum [?] to unknown, 04/01/1899. Letter from Ye Chayum [?] to unknown, 04/01/1899. 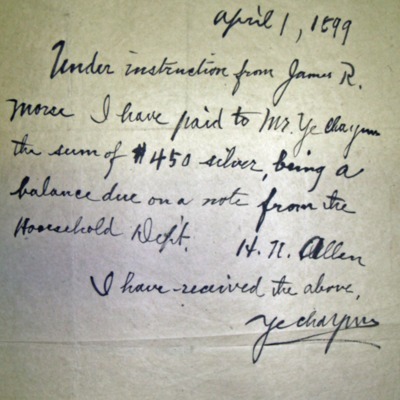 Allen paid a sum of $450 in silver to Ye Chayum. 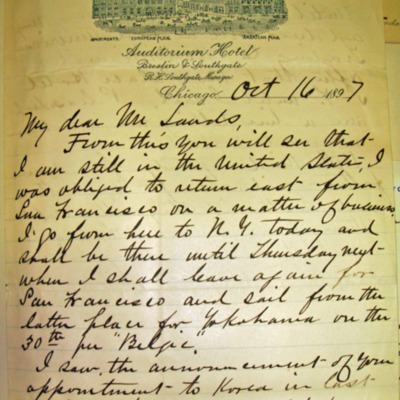 Letter from Jim McMorton to William Franklin Sands, 10/14/1899. 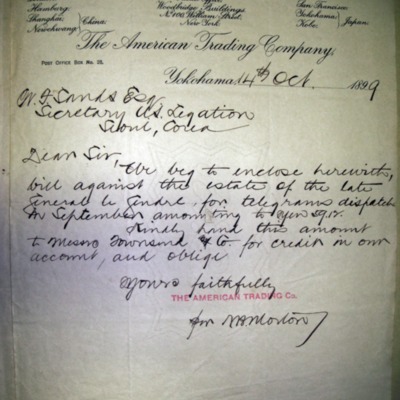 Letter from Jim McMorton to William Franklin Sands. He is sending a bill against Le Gendre’s estate for use of the telegraph. 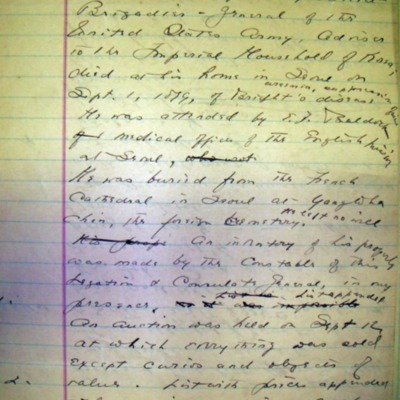 Memo about the Estate of C.W. Le Gendre. 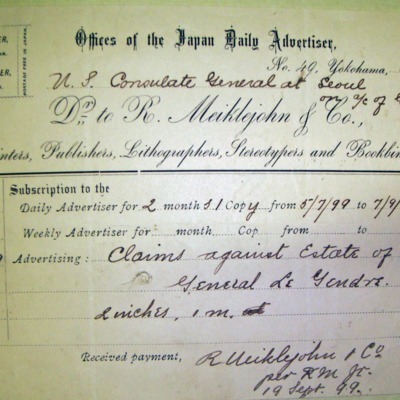 Invoice for a subscription to The Japan Daily Advertiser from 05/07/1899 – 07/09/1899.